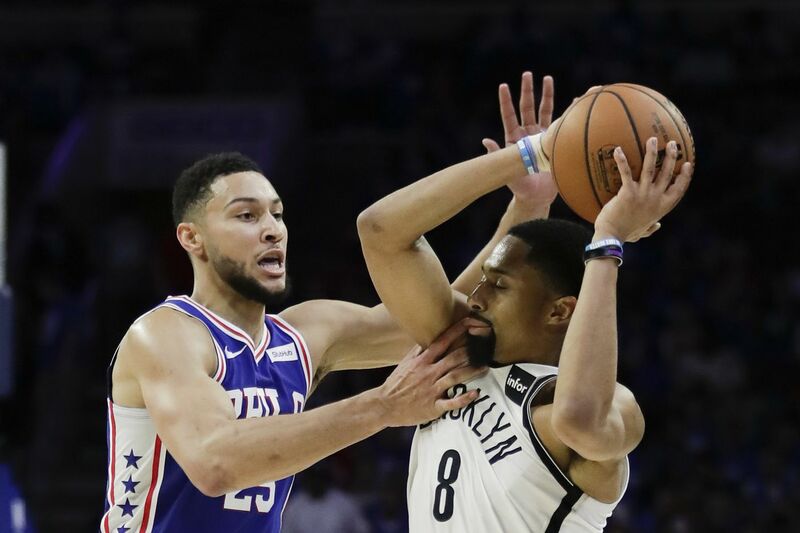 Sixers guard Ben Simmons defends Brooklyn Nets guard Spencer Dinwiddie during the second-quarter in game one of the Eastern Conference playoffs on Saturday, April 13, 2019 in Philadelphia. Ben Simmons was at the free throw line with 1 minute, 47 seconds left in the third quarter and the 76ers trailing the Brooklyn Nets, 89-78 in Game 1 of the NBA playoffs. When he missed the first attempt, a scattering of fans booed him. When he missed on the second attempt boos filled the Wells Fargo Center. It wasn’t the first time on Saturday the Sixers heard the audible frustration of the fans. The were booed multiple times throughout the game, but Simmons was the target of the crowd’s ire in that moment. After the game, when asked about the frustration of the crowd, Simmons had a not-so-friendly suggestion for Sixers fans. By the third quarter Simmons had hit just 2-of-6 shots and made one free throw, largely becoming invisible on the offensive end of the floor. The fans had been growing increasingly frustrated that he wasn’t asserting himself with one fan yelling, “Ben wake up," during a dead ball moment. It’s probably a little bit easier for Butler to walk away with more of a positive outlook on the situation after finishing with 36 points, nine rebounds, two steals, and two blocks. Not only was he one of the very few reasons the Sixers weren’t blown out by 30 points but the fans weren’t directing their anger specifically toward him. When asked what Butler thought of Simmons’ comments about the fans, Butler left the situation in Simmons hands. Someone might want to talk to Simmons about it though. Choosing to take a stand against the fans is not a great way to start off the playoffs. And, it’s no secret that Philadelphia fans are not the ones that you want to give more ammunition to. A response it’s definitely what’s needed from Simmons. If he is able to turn things around in Game 2, that might take away some of the sting, but will it be enough for Sixers fans to move past him telling them to go over to the other side? We’ll find out on Monday.